This Mess-Free Glitter Menorah and Dreidel Kit is perfect for kids to create beautiful sparkly decorations for your home — without the mess! The dreidel would be a great activity to keep the kids entertained while hosting guests, and the menorah would look beautiful on display. 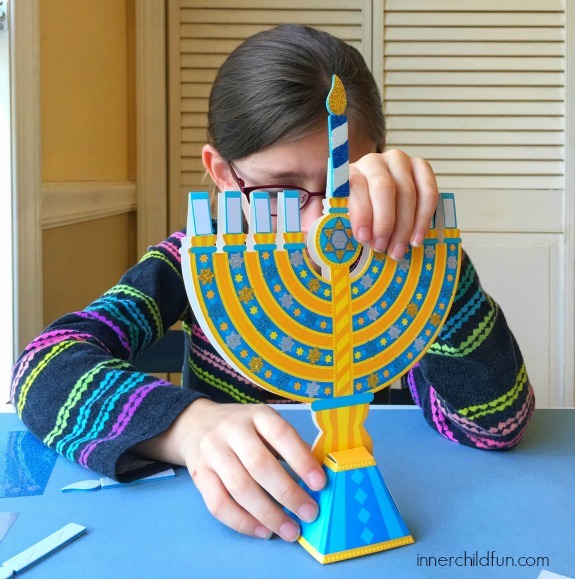 The best part is that “lighting” this flame-free menorah is as simple as decorating a mess-free glitter candle, making it safe for little ones to “light” a menorah of their own! A big thank you to our friends at Melissa & Doug for sponsoring today’s Mess-Free Hanukkah Crafts! The Mess-Free Glitter Menorah and Dreidel Kit is available on the Melissa & Doug website, and it comes with 1 glitter sheet in each of five traditional colors: white, silver, gold, light blue, and dark blue. If you would like to add more colors to the kits, I highly recommend the Mess-Free Glitter Booster Pack, since it contains a large variety of colors! To use Mess-Free Glitter, simply remove a piece of paper backing to expose the adhesive, press the glitter sheet on top and rub with your finger to transfer the glitter, and peel off the glitter sheet to reveal your sparkly design! You may find some of these tips for working with Mess-Free glitter to be helpful. The cardboard dreidel was simple to put together, but also kept my daughter happily entertained for a long while. She took her time and was so proud of her finished projects! I love that these kits provide all the sparkle and fun of glitter — without the mess! The cardboard menorah is double-sided so there are plenty of spots to add sparkly glitter designs! Once the menorah is decorated, fold up the cardboard stand and insert the menorah into the stand to display it proudly in your home. You can add the center candle and then decorate and add the other candles one at a time throughout the eight nights of Hanukkah! I would recommend these kits for ages 5 and up. My two kids (ages 7 and 11) have enjoyed several Mess-Free Glitter projects and they frequently work on them together or with friends. I love having different sets on-hand for rainy days or anytime they may want to do a quick and FUN project! There are several different Mess-Free Glitter kits available here. If you happen to celebrate Christmas, you can see how we used our Mess-Free Glitter Christmas Ornament Kit to create gift tags, party favors, advent activities, and more!